Arriving in Laprak it was sad to see the people living in plastic shelters, far from their old houses down in the valley. Arriving in Laprak I met a government health worker. He took me to a family house where I could stay and eat. Before the earthquake this family had a hotel in the original Laprak village further down the valley. Gurung lady smoking a cigarette. I joined the health worker to visit one of the local people who needed his help. A man had been hit on the head by a stone the day before. No one was sure if the stone was rolling down from the mountain or if it was thrown by some local boys. Sometimes local boys spend their days drinking raksi (a spirit made from rice). They can get very aggressive and violent at times. This is also one reason that people warned me about traveling on my own especially because I am not Nepali. In the past tourists have been attacked and robbed or even killed while trekking alone in remote areas. My friend and health post worker guided me around in 'new' Laprak. Setious head wound treated by the healthpost worker. Replacing the bandage after cleaning the wounds. The man had a wound on his head and behind his ear. The healthcare worker slowly started to remove the bandage. He used sterile saline to try to make it easier to remove the bandage without damaging the wound. After the bandage was removed the health worker cleaned the wounds. The man’s family was sitting with him and helping to keep his eyes clear of the saline, betadine and blood that were dripping down his face. There were a lot of stitches, especially behind his ear. The man’s ear had been almost completely severed by the falling stone. The healthcare worker said that both wounds were so deep he could see the bone. Because of the severity of his injuries the man was going to Kathmandu the following day to have a CT scan to make check for further injuries. Building his new house in the same way as before not realizing that a new earthquake will destroy it again. In the monsoon Laprak is almost always covered in clouds. Some rain is falling most of the time so people going to their fields or carrying goods up cover themselves in plastic. Most of the people now live up on the mountain where it is not so steep and there is less risk with possible future earthquakes and landslides. Their original village is one hour walking down the valley. Here they had their traditional stone houses and the fields that fed them. 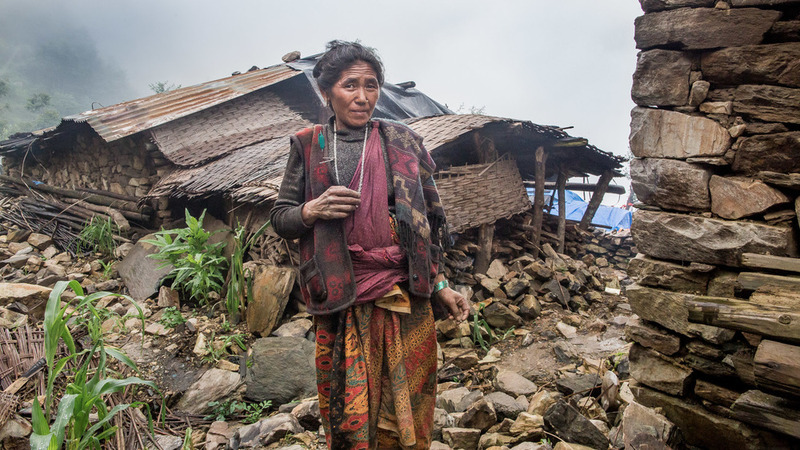 The Nepali Government has announced that all people living the more dangerous lower areas will not receive any support if something happens in the future. But many people are still living down below in the valley. Most of the older people don't want to leave their houses to go to a place where they have nothing and some are too old to make the two hour walk up. The old entrance gate to the village of Laprak. After taking care of the patient we walked down to the original village of Laprak. It is a steep walk sometimes crossing the road which had now been destroyed by the monsoon rain. It was a sad sight arriving at the half destroyed entrance gate of Laprak with the ruins of houses and a big school visible in the background. Children playing in 'old' Laprak down in the valley. A few houses were still standing but taking closer look I could see that all were cracked or partly destroyed and unsafe to live in. While walking through the ruins I found lots of personal possessions such as pots, pans, stools, tables, and furniture and school books. Lady at the ruins of her house in 'old' Laprak. Children on their way to school. We could see smoke coming from a house and decided to take a look. Inside there was a very old lady. She was milling her corn using a traditional grinder consisting of two circular flat stones lying one on top of the other. The corn is placed between the stones and ground by rotating the stones against each other using a wooden handle attached to the upper stone. Behind her, in the corner of the kitchen, a fire was burning to keep her warm and to use later for preparing a meal from the crushed corn. Proving that working together is necessary to achieve your goals. Proof that non cooperation will end in failure: the book fell down. Students explaining the importance of hygiene. The walk up took two hours and was long and steep. On the way we met lots of villagers carrying goods up that they had collected from their destroyed houses and food that they had harvested from their fields below. It was good to see that even with the extra effort required most of the people had decided to live at the safer places higher up the mountain. It was dark when we arrived back in the higher village. During the evening the temperature dropped to under 10 degrees. Because this was the warm season I hadn’t brought any warm clothes with me from Kathmandu. I was happy to join my friend in a glass of raksi accompanied by the traditional snack of fried buffalo meat (which is made by frying strips of cured meat). I was even happier to sit close to the fire where food was being prepared. While sitting here I met two workers from Oxfam. They had just finished building 52 toilets in the Laprak area. They were also providing hygiene education at the local school. We agreed that it is very hard to change the behaviours of the older generation and it is better to focus on educating the younger generations by teaching at schools. The practical results of their classes were unfortunately very hard to see! More time is needed before bathing and washing hands before eating becomes a habit. Now there is a health post in Laprak but before they had to travel one hard long day to Gorkha for medical support. Because Laprak is at 2300 meter about sea level it can get cold in evening. They warm themselves at their fires. Mother with her daughter looking over the valley. There was also a woman providing maternal and child health care. She explained that until now the pregnant women had delivered their babies in their own homes and not at the health post where they could be cared for in a hygienic and comfortable environment. This because of the strong traditions within their culture. She was glad pregnant women were coming for antenatal care to check the health of both the mother and the baby. While sitting in the tent I listened to the sound of people playing their traditional flutes. They start playing early in the morning and keep going until late in the evening. I decided to stay at least one more day in Laprak and search for a local who could take me over the mountains to Machhakhola from where I hoped to walk on further to Aarughat by myself. If this wouldn't be possible because of danger of landslides and aggressive local people then I would return the same way back through Barpak and Baluwa and finally to Gorkha. My interest to see more of the smaller remote villages and their situations after the earthquake kept me motivated to go there. I had seen Machhakhola, Lapubesi, Soti Khola and Arughat before the earthquake and wanted to see what had happened in these villages. Child close to her plastic house on the top of the hill where ''new' Laprak is situated. Girl reading her schoolwork as part of the morning assembly to the other 200 students. The next morning I joined the two social workers from Oxfam and went to the biggest local school. Here they would give hygiene education and I would join them to photograph the lesson. The Nepali school day always begins with a Assembly. All the children line up by class. At the left is First Class with the very little children from 3 and 4 years old and so it goes all the way to the oldest pupils in Class 10. First the teachers addressed the children and outlined the school day before introducing the two social workers from Oxfam. Then the morning exercise drill began. The teacher loudly instructed the pupils to put their hands in the air and the children responded. Then the teacher shouted that they had to stretch their arms straight out in front of them. Another teacher beating a drum set the pace. It was good to see that also after the earthquakes they continued these policies, set by the Ministry of Education in Kathmandu and is followed all over Nepal (and India too). It’s a very old fashioned thing from Britain. However it is good for the kids that they are back in their usual routine. Morning assembly at the school ground. In line for the morning assembly. While at the school I realized how very different these children’s faces were compared with those I had saw in Solukhumbu a few weeks ago. In Solukhumbu the people were characterised by rounder faces while here in the Gorkha region people looked more Tibetan in appearance. 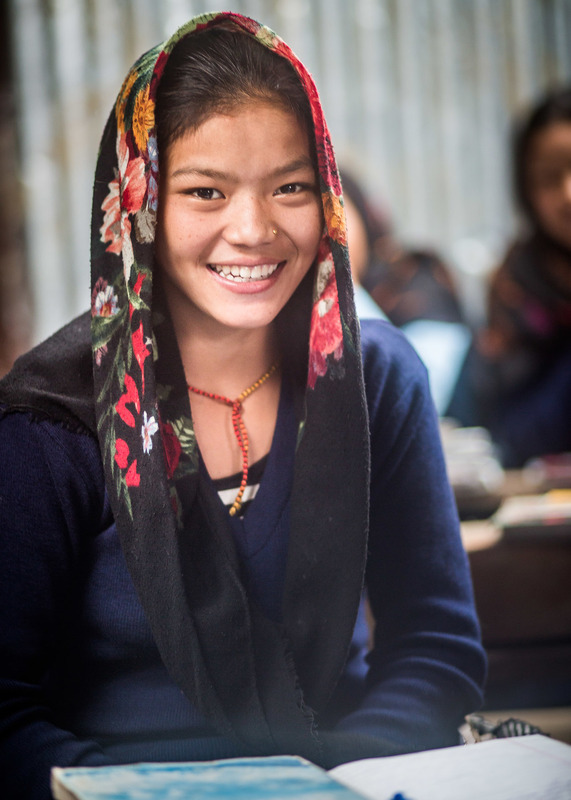 The people in Gorkha are Gurungs and have their own language which is closer to Tibetan than to Nepali. But most of the people understand and speak some Nepali. You could see some were poor and had ripped clothing. Others had dirty faces, something that you see often in these high remote villages. While taking portraits some of the children realized this and started cleaning their faces which were half covered in snot. After the morning assembly all classes would leave separately to their classrooms. The hygiene class started by explaining that cooperation is necessary to make any programme successful. Six pupils were selected to come forward and introduce themselves. After the first pupil had introduced herself she was given a rope. As the other 5 pupils introduced themselves they were connected to this rope until it resembled a spider’s web. On to this web the healthcare worker placed a book and then asked one of the pupils to let go of the rope and stop cooperating with the rest. The book then fell down demonstrating that without cooperation it was impossible to complete their task. I was starting to realize that this temporary tin building was far from ideal. If children in the next classroom started talking it became difficult to understand the teacher in their own classroom anymore. There was none of the proper sound proofing of their past stone buildings. After a while it started raining and I realized another the problem with this building. The sound of the rain falling on the rooftop was so loud that it was impossible to hear the teacher’s voice. While it was raining all the classes stopped. Luckily this time it only took about ten minutes before the rain stopped but in this season it could sometimes rain all day. If this happened the children would be sent home and there would be no more schooling for them that day. After two hygiene classes I interviewed one of the English teachers. He told me that 16 years ago Laprak had been destroyed by a major landslide. The people were given the choice then to move their village to a higher, safer area but they had all decided to rebuild the village on the original site. Most of the people I spoke to are not sure where they want rebuild their homes in the future. Their land is further down but higher on the mountain there is free land available. After the earthquake they created a committee divide and allocate this free land on a temporary basis. Perhaps they will use this as a starting point to divide the land for constructing new houses. Some people are now already rebuilding down in the village. I was told that they will use these buildings to store food harvested from the land situated in the ruins of the old village. Boy playing his traditional Gurung flute just before sunrise. At sunset I walked around Laprak and searched for the flute playing boys. They would stand on little viewpoints so the sound would spread out over the houses below. Girl from 2nd class: a little bit shy. At sunset I sat down in a family and drank some raksi with the government health post worker and the two workers from Oxfam. The wife was preparing dal bhat on the fire. She talked with my friends about the smoke from the fire and how much of a problem it is for her breathing. Even after the cooking was finished the smoke stayed in the little tent, including in the inner sleeping area, for a long time. Strangely there was a chimney but it didn't function well. The smoke escaped around the sides of the cooking pot while the chimney was connected to the rear of the fireplace, too far back to draw the smoke into it. In most of the Nepali houses in the mountains the cooking is done on an open fire without a chimney. Only in places with road connections is it possible to buy bottled CNG to use with a gas stove. Even if they have gas stoves, higher in the mountains people will continue to use open fires because they keep them warm in the cold mornings and evenings. Nepali women have very high rates of respiratory disease and lung cancer despite most not smoking. Just before sunset this lady came back from the forest to light her fire for cooking and warmth during the evening. One of the women present lost her husband in the earthquake. He was only 25 years old. She was pregnant at the time. Her husband had been working with 50 other people on the construction of a new house. Eight of them didn't survive. Now the baby is 3 months old. In Gurung culture it is not possible to remarry so she will be alone with her child for the rest of her life. Baby standing in her basket starting to cry after seeing a strange white face. Older PostFROM BALUWA TO THE EARTHQUAKE EPICENTRE IN BARPAK.